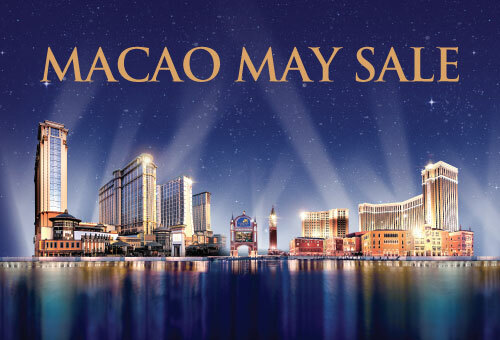 (Macao, May 2, 2016) – Sands Resorts Cotai Strip Macao and Sands Macao are offering incredible savings during the 11-day Macao May Sale with savings of up to 40% for guests looking to book a getaway in Macao. The May Sale allows guests to book rooms from May 3-13, 2016 for stays between May 3 and Dec. 31, 2016. The limited-time offer provides amazing deals for visitors who want to enjoy either a luxury or family getaway at either The Venetian Macao; Four Seasons Hotel Macao, Cotai Strip; The St. Regis Macao, Cotai Central; Conrad Macao, Cotai Central; Sheraton Grand Macao Hotel, Cotai Central; and Holiday Inn Macao Cotai Central, and Sands Macao. Rates start from just HKD/MOP628*. With accommodation choices to suit all budgets, guests can also indulge in some retail therapy at more than 650 duty-free retail stores, dine in wide range of award-winning local and international restaurants, or enjoy world-class entertainment during their stay at Sands Resorts Cotai Strip Macao and Sands Macao. Book a room now to enjoy this limited-time sale and experience the fabulous integrated resort. Accommodation for two in a Royale Suite starting from HKD/MOP1,088* per night. Accommodation for two in a Deluxe Room starting from HKD/MOP1,688* per night. Accommodation for two in a Deluxe Room starting from HKD/MOP1,138* per night. Accommodation for two in a Deluxe Room starting from HKD/MOP838* per night. Accommodation for two in a Superior Room starting from HKD/MOP628* per night. Accommodation for two in a Deluxe Suite starting from HKD/MOP1,088* per night. WeChat and Facebook followers of the integrated resort can also enjoy extra savings during the Macao May Sale. WeChat users can now use WeChat Pay to pay for their room bookings and during the Macao May Sale, hotel vouchers up to the value of HKD 400 can also be used for room bookings. For Facebook fans they also have the chance to win a Hong Kong to Macao Free First Class Cotai Water Jet ferry ticket. Follow us on WeChat (SandsResortsMacao) or Facebook (Venetian Macao) to receive this exclusive offer now. For more information about the Macao May Sale, please visit SandsResortsMacao.com/macao-may-sale and about WeChat and Facebook offers, please visit venetianmacao.com/fans. * Price is subject to 10 % service charge and 5% government tax. Terms and conditions apply. With 3,000 suites, The Venetian Macao features stunning replicas of the famous canals and architectural icons of Venice, Italy. Throughout the integrated resort, guests can enjoy world-class entertainment shows at the 15,000-seat Cotai Arena, dine at more than 30 restaurants including the Michelin-starred Indian restaurant Golden Peacock, and explore more than 300 stores at Shoppes at Venetian. Families can also enjoy gondola rides, Streetmosphere entertainment, Qube Kid’s Play Zone, swimming pools and the Grado miniature golf course. The Four Seasons Hotel Macao is designed to meet a growing demand from affluent travellers seeking privacy, personalised services and exclusive experiences. Guests can stay entertained with direct access to the Shoppes at Four Seasons and an array of award-winning restaurants and bars. In addition, guests can relax at the wonderful outdoor facilities which include pools, private cabanas and resort-themed gardens and terraces. Recently voted “The Best New Hotel in Macau” by TTG China Travel Awards 2016, The St. Regis Macao is ideally positioned along the coveted Cotai Strip, right at the doorstep of premier shopping, dining and entertainment venues. The St. Regis Macao features 400 lavishly appointed guestrooms and suites, and offers the signature St. Regis Butler Service for all guests – a first for Macau – providing 24-hour anticipatory service, customizing each guest’s stay to their specific needs, tastes and preferences. Celebrating Macao’s reputation as a world-class gastronomic destination, the hotel also features The Manor, a multi-experience dining venue, which prides itself on serving high quality dishes made from the finest ingredients sourced from around the world. Conrad Macao, Cotai Central is a world-class, contemporary, stylish hotel located at Sands Cotai Central, offering stylish guestrooms and suites in a 40-floor tower overlooking Cotai Strip. Guests can stay entertained with direct access to a selection of restaurants including the home of classic authentic high-end Chinese cuisine, Dynasty 8; Grand Orbit, which features an international buffet; and The Lounge which offers signature afternoon tea sets and a creative snack menu. Guests can also indulge themselves among 150 luxury brand shops at Shoppes at Cotai Central or relax at the award-winning Bodhi Spa, Pool Deck or Health Club. Located right in the heart of the vibrant Cotai Strip, Sheraton Grand Macao Hotel, Cotai Central is not only the largest hotel in Macao, it is also the largest Sheraton in the world. Sheraton Grand Macao Hotel enjoys an enviable position, with instant access to all of Cotai’s exciting attractions. Spread over two towers – Sky and Earth – distinctive design and impressive functionality characterize the 4,001 stylish, warm and welcoming guestrooms and suites, many with views of the Cotai Strip. Guests are welcome to enjoy exceptional dining at Xin, Bene and Feast; shop at more than 150 retail stores at Shoppes at Cotai Central or unwind at the Shine Spa for Sheraton. Holiday Inn Macao Cotai Central has the unique distinction of being the only Holiday Inn in the world to receive an official Star Rating by Forbes in 2016, offers guests the comfort of genuine services, tailored to their specific needs. Guests can enjoy easy access to 650 of Asia's top retail outlets, restaurants and bars and take advantage of the DreamWorks Experience at Sands Cotai Central, which brings a host of family-friendly entertainment to visitors. With 289 luxury suites, Sands Macao offers a wide range of diversions including specialty restaurants, a heated outdoor swimming pool, deluxe spa and salon, conference and banquet facilities and unrivalled live entertainment at Xanadu bar. Photo caption: Sands Resorts Cotai Strip Macao, comprising The Venetian Macao; Four Seasons Hotel Macao, Cotai Strip; The St. Regis Macao, Cotai Central; Conrad Macao, Cotai Central; Sheraton Grand Macao Hotel, Cotai Central; and Holiday Inn Macao Cotai Central, with Sands Macao, launches the Macao May Sale. Booking period lasts from May 3 to 13, 2016 for stays from May 3 to Dec. 31, 2016. Sands China Ltd. is the leading developer, owner and operator of integrated resorts in Macao. The befittingly named Sands Resorts Cotai Strip Macao, situated on reclaimed land between the islands of Coloane and Taipa, is the one destination that provides a stunning array of experiences at the heart of Cotai. Sands Resorts Cotai Strip Macao has transformed a day-trip market into an integrated resort city and international hub for business and leisure travellers. Pulsating with life, both night and day, Sands Resorts Cotai Strip Macao features an expansive offering of affordable luxury available nowhere else in Macao. With the opening of The Parisian Macao, it will have nearly 13,000 hotel rooms and suites, international superstar live entertainment, duty-free shopping with more than 800 retailers offering an unparalleled array of name brands, 2 million square feet (186,000 square metres) of meeting and exhibition space for Asia’s leading conferences and exhibitions, transportation offerings and well over 125 dining options, including Michelin-starred restaurants, bars and lounges. Sands Resorts Cotai Strip Macao is a must-go destination providing every guest with an unforgettable experience and unparalleled excitement. Comprised of The Venetian® Macao; The Plaza™ Macao, featuring the Four Seasons Hotel Macao; and Sands® Cotai Central, featuring the world’s largest Conrad, Sheraton, and St. Regis hotels as well as the Holiday Inn. Sands Resorts Cotai Strip Macao is where Asia’s ultimate destination is all within reach. And coming in 2016, the crowning achievement of Sheldon G. Adelson’s vision of the Cotai Strip - The Parisian Macao. For more information, please visit ParisianMacao.com. For more information, please visit http://en.sandsresortsmacao.com.